Commando collects football scarves from every city we visit and, once he’d had a shower, he wanted to go back to Boulevard Saint Michel to look in a shop he’d spotted where he thought he might be able to get a Paris St Germain scarf. 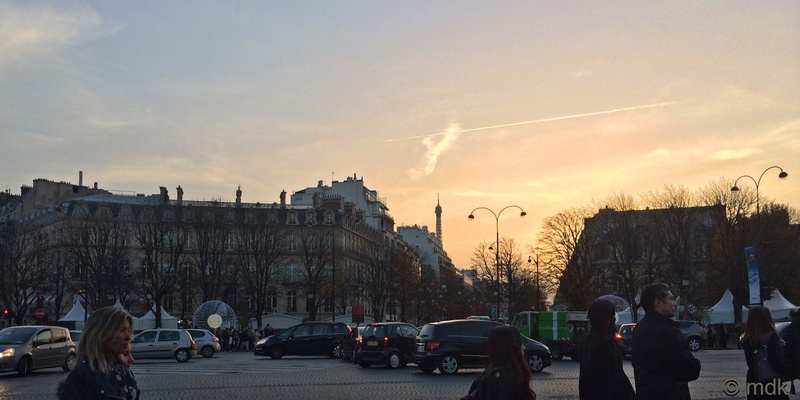 With all the getting lost and the extra walk around Jardin du Luxembourg time was getting on and, when we found ourselves back on Boulevard Saint Michel passing La Croissanterie St Michel, we realised we hadn’t had any lunch. 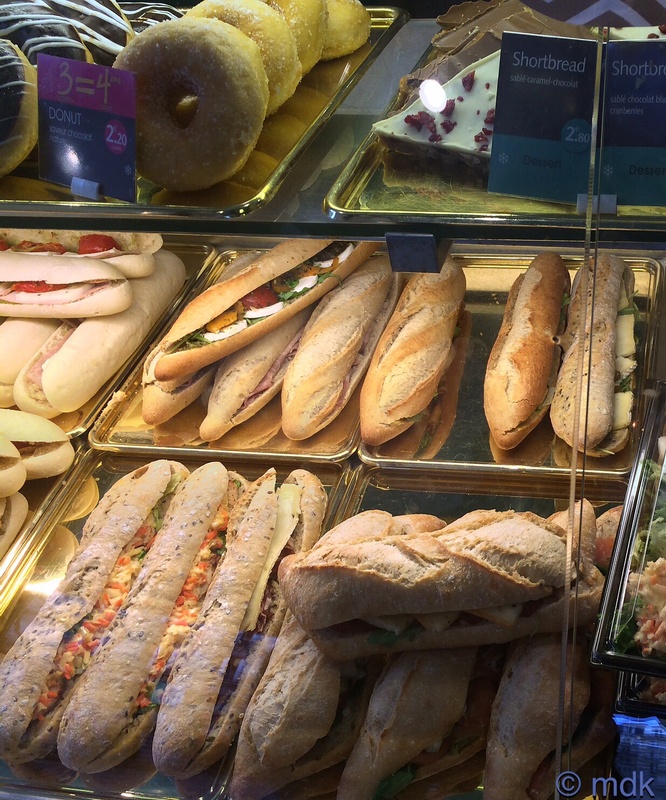 The display of baguettes and cakes was mouthwatering and, after a lot of drooling, we finally settled on a chicken salad baguette to share and a muffin each. Delicious. After that there wasn’t really a plan as such. 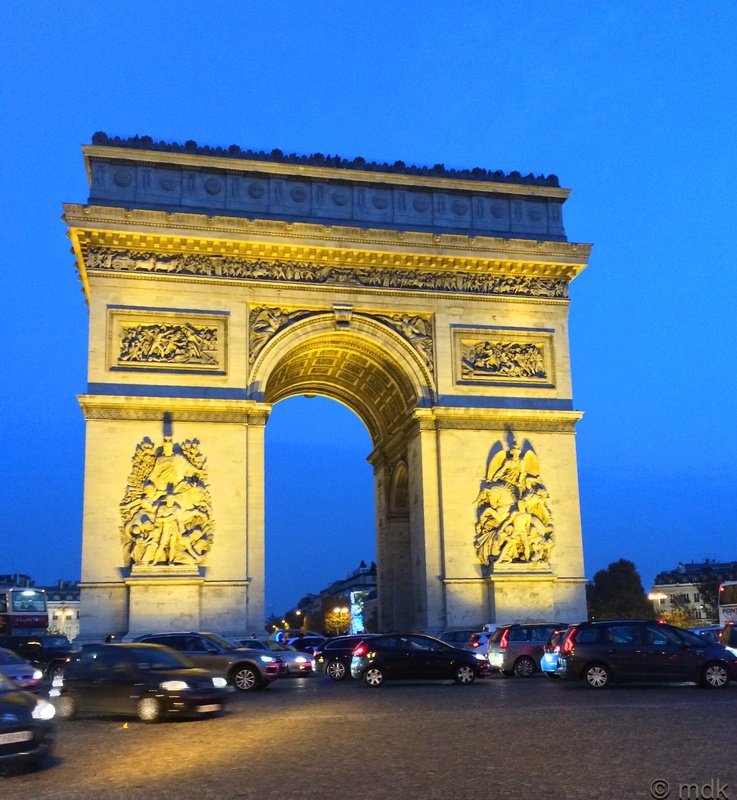 Neither of us are really excited by the normal tourist things as a rule and we’d both been to Paris more than once before and gawped at the Arc de Triomphe, the Champs Élysées and Eiffel Tower. To us the heart in a city is found just wandering about. 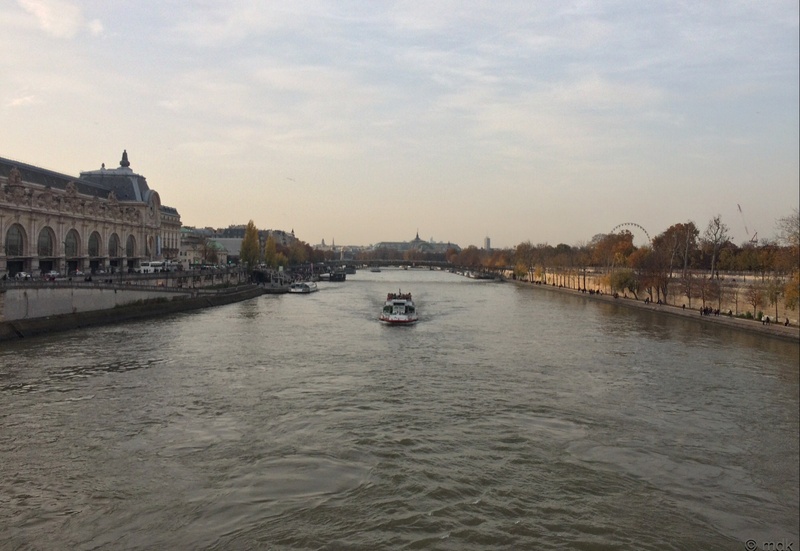 Neither of us had ever strolled along the banks of the Seine before though so we decided to make our way back to the river and do just that. 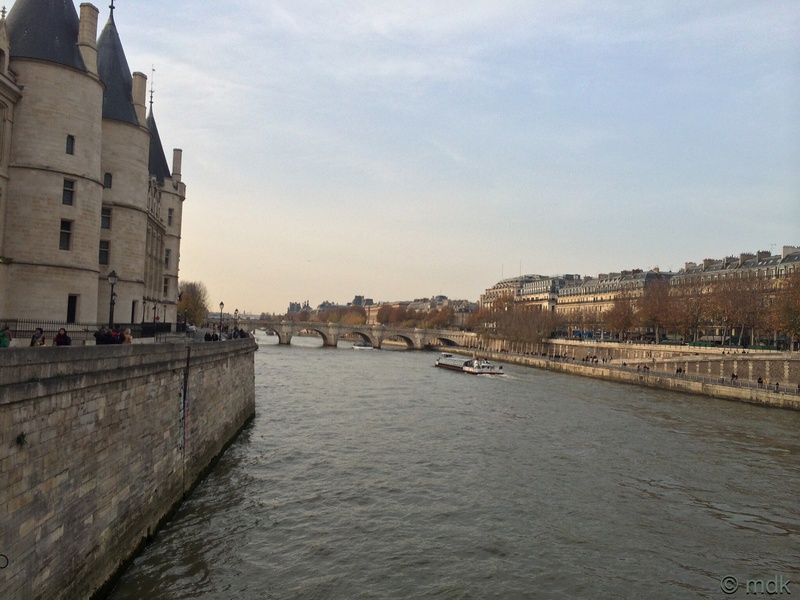 Perhaps we’d even take a bateau mouche. 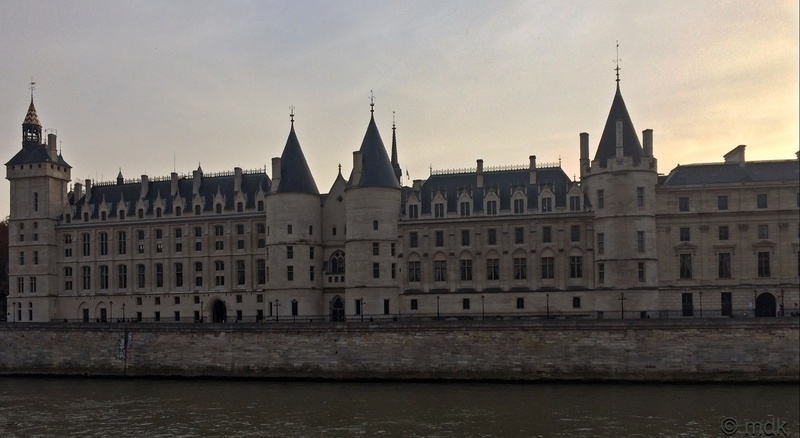 As we crossed Pont au Change dusk was already beginning to fall and the sky behind the Conciergerie had a pink glow. 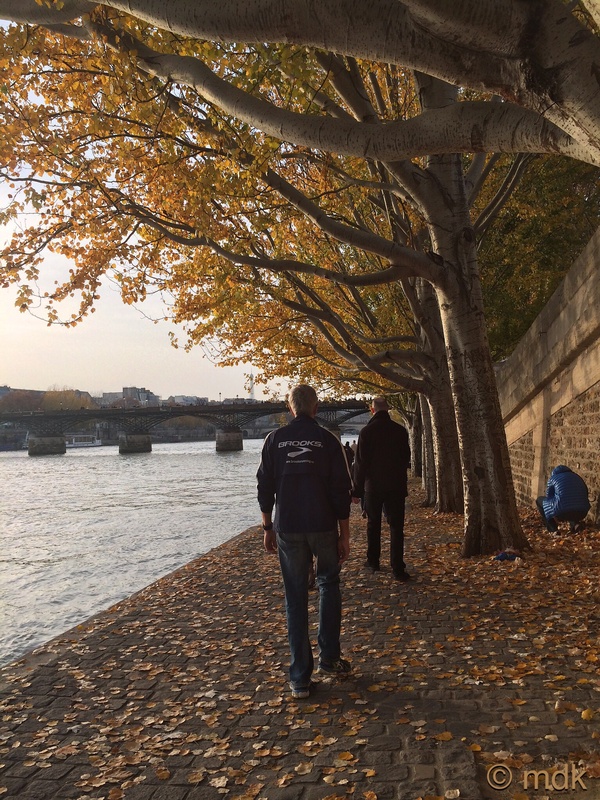 Across the river the buildings were silhouetted against the setting sun and a golden light bathed the cobbled walkway strewn with fallen leaves. There were a few other people about but it felt quite peaceful tucked away below the busy Roads. People were swarming across Pont des Arts as we approached which put me off going to have a closer look at the love locks that have caused so much controversy. The bridge was built in the early 1980’s an exact replica of the original nine arch metal pedestrian bridge built in 1802, although the new bridge only has seven arches so I’d hardly call that exact. 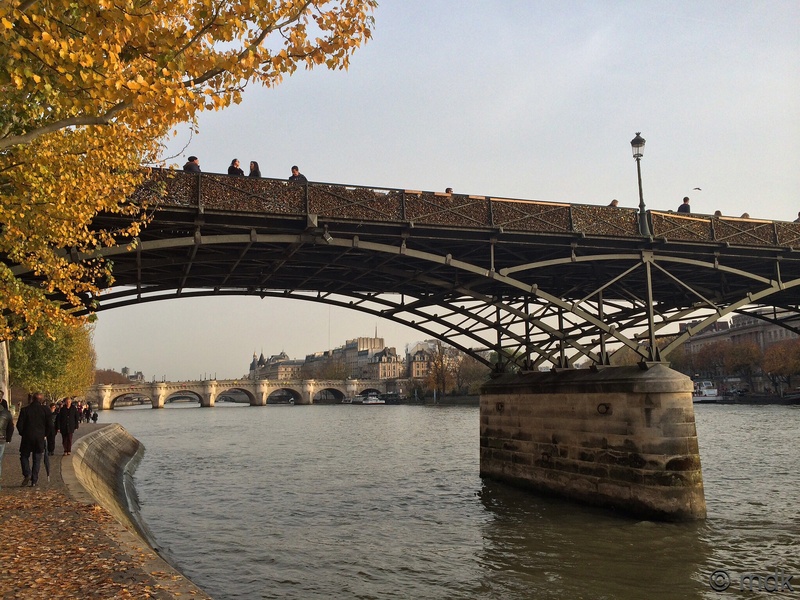 This had been the first metal bridge in Paris but, sadly, World War II bombardment and several collisions by boats had damaged it beyond repair. The new bridge is beloved by artists and photographers but the mass of love locks that started to spring up in 2008 caused a parapet to collapse and created safety fears. Glass panels have been put up in some places to try to stop the proliferation of locks. Whilst I understand the romance of putting a lock on a bridge, as we did in Cologne, I can also see that there is a limit to how many locks a delicate bridge like this can take. As we passed underneath we could see just how tightly packed those locks are. It would be a shame if such a lovely bridge collapsed under the weight of all that love. A mass of colourful locks can be quite a lovely sight in the right place but everything in moderation. Maybe the authorities could erect something more sturdy somewhere else for people to make their pledges. 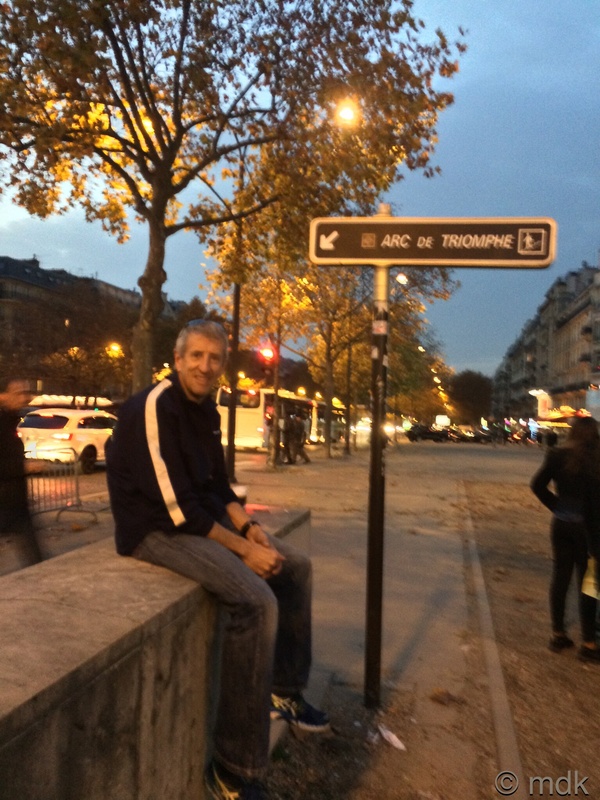 Close to the Port des Lions of the Louvre we climbed back to the street so we could cross Pont Royal and maybe take a bateau mouche. 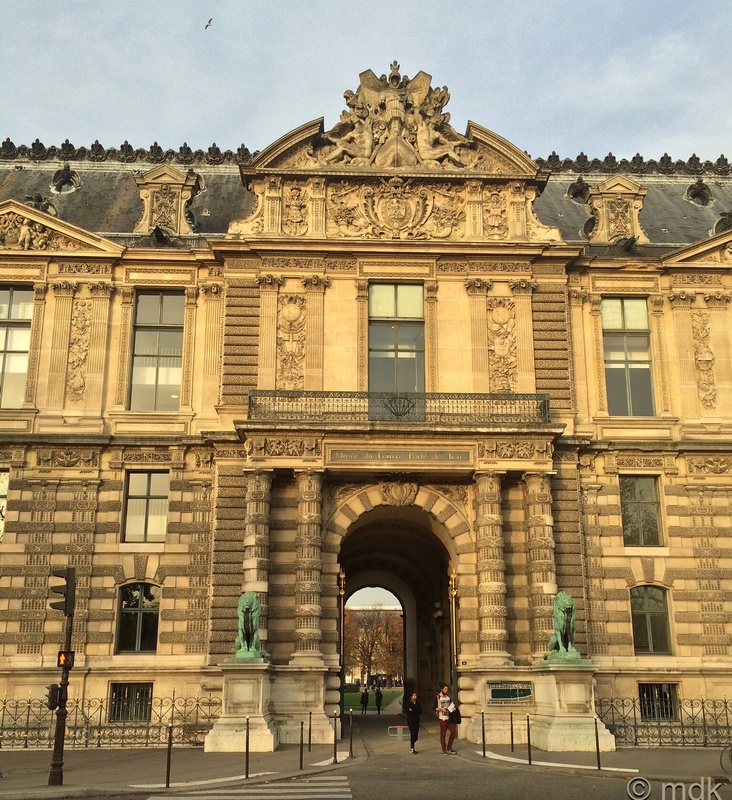 Both of us have toured the Louvre before so there was no hardship in leaving it behind. Even now I remember my disappointment at seeing the Mona Lisa for real. It was supposed to be the highlight of my visit but it was so small and behind glass, it hardly seemed worth the effort. Maybe I’m just a philistine but there were so many other paintings I felt much more worthy of fame. When we got to the marina it was clear the boat we’d just seen going under the bridge was the last one leaving. Either that or we’d have a long wait as there were no others in sight. This will have to be another thing for our next visit I suppose. 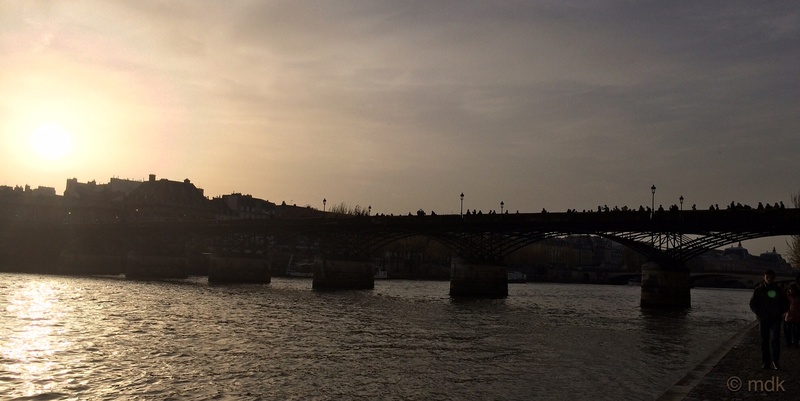 Instead we walked along to the Passerelle de Solférino and crossed back again. 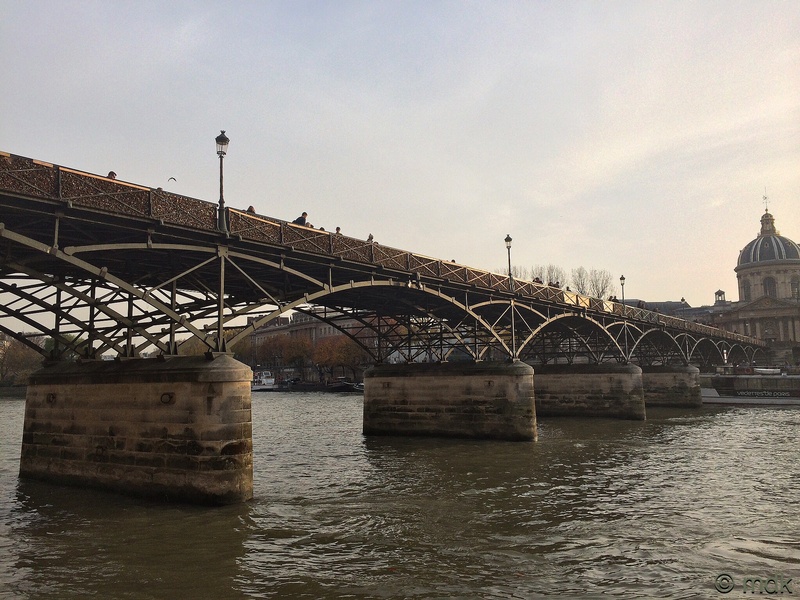 This odd two tier bridge was built in the late 1990’s by Marc Mimram and crosses the Seine in a single span. Mimram won the Prix de l’Équerre d’Argent for the innovative design. As we started on the lower level it felt like a steep climb to the summit but there were love locks to see along the way. 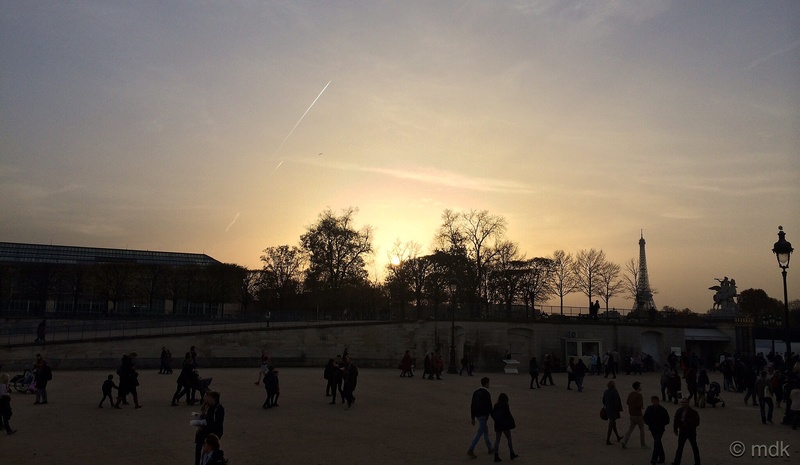 By this time the fading light made it hard to appreciate the beauty of the Tuileries Gardens so we made for the Place de la Concorde for want of something better to do. In actual fact we were intrigued by the giant wheel, a little reminiscent of the London Eye, that we’d been watching growing bigger as we walked along the Seine. Up close it was nowhere near as attractive as the Eye, which seems a little odd for the ever stylish French. 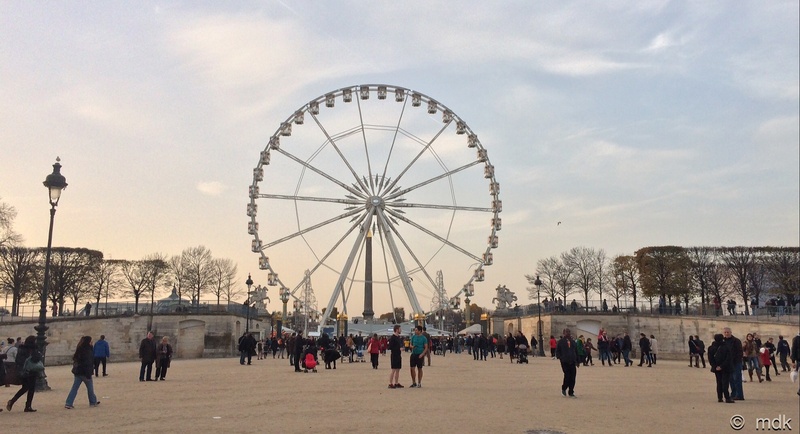 This turns out to be the Roue de Paris, a 60-metre tall transportable Ferris wheel. 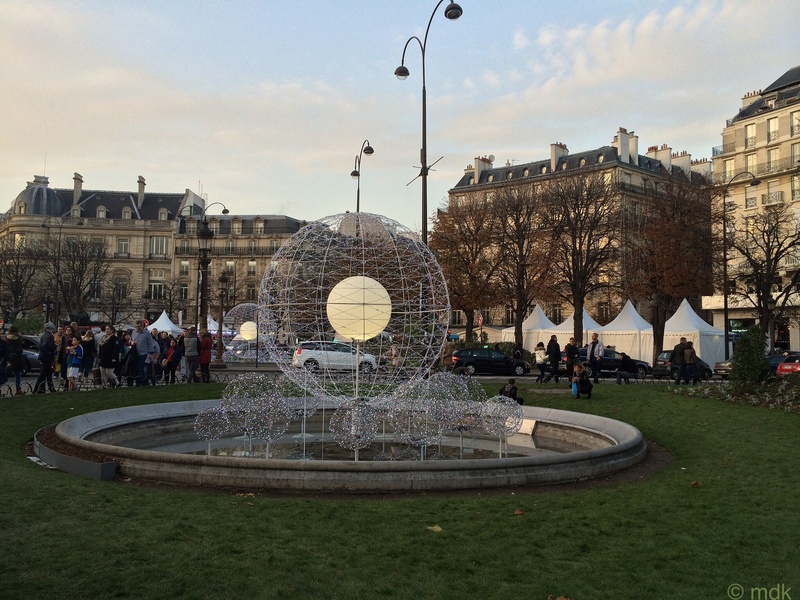 It was originally installed on the Place de la Concorde for the millennium celebrations. This is not a permanent installation as the wheel has no foundations. Instead forty thousand litres of water filling the base hold it in place. It has actually popped up all over the world and is currently back in Paris but I wasn’t even slightly tempted to queue for a ride. 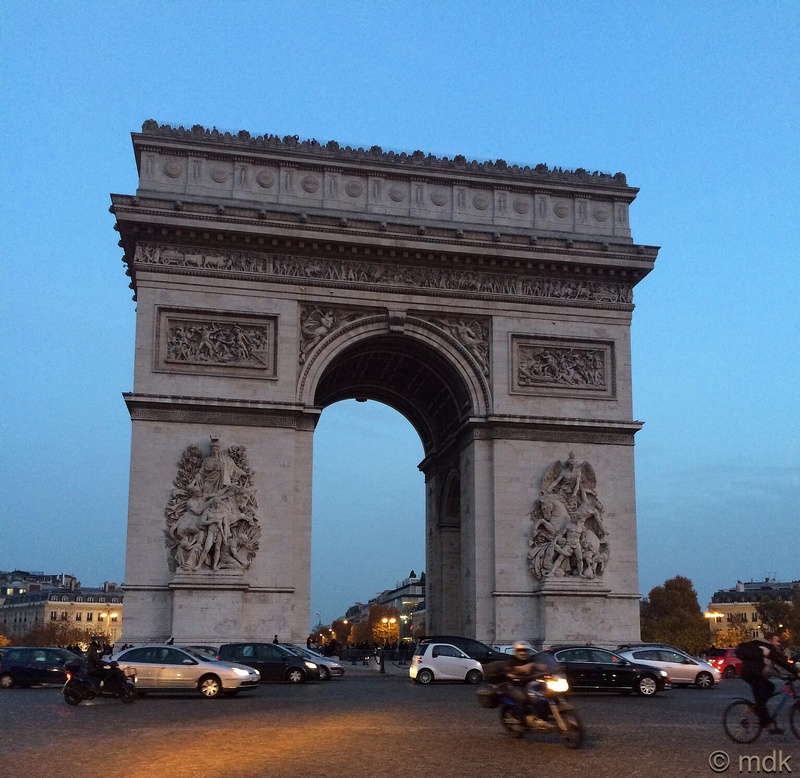 To be honest I wasn’t really all that tempted to walk along the Champs Élysées either but we were there and Commando thought it would be nice to wander up to the Arc de Triomphe. After all we’d gone a whole day without going near a grave and the Arc does contain the tomb of the unknown soldier. 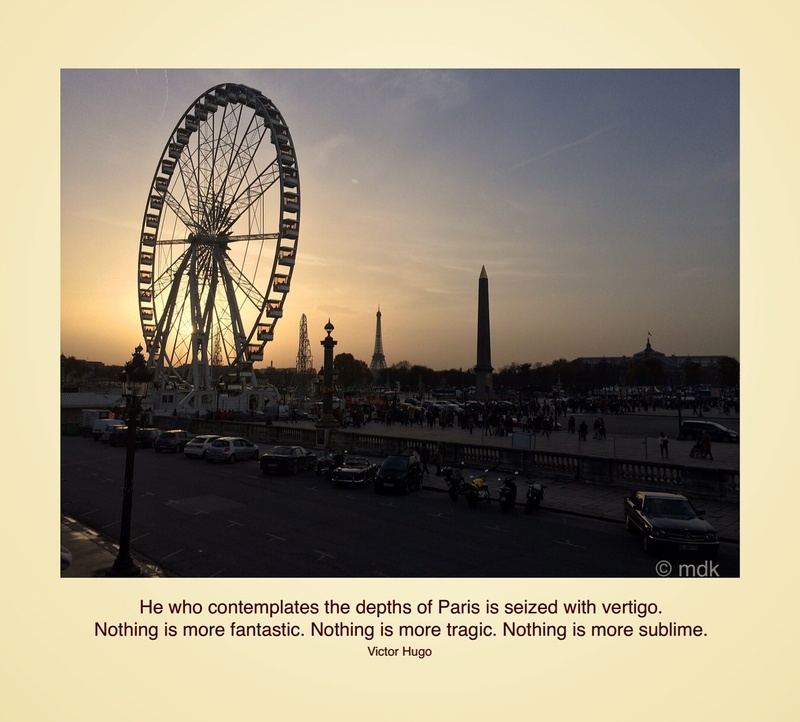 As soon as we got to Place de la Concorde the crowds got thicker, making me think of the mobs that had once crowded there to watch Madame La Guillotine do her gruesome work. Wandering it most certainly was not. We were carried along in a sea of people and I had to cling to Commando’s hand to avoid being separated. When you are small of stature crowds can be quite scary. All you can see is a mass of chests and backs and it’s almost impossible to get your bearings. Crowds always make me feel claustrophobic and I tend to avoid them. 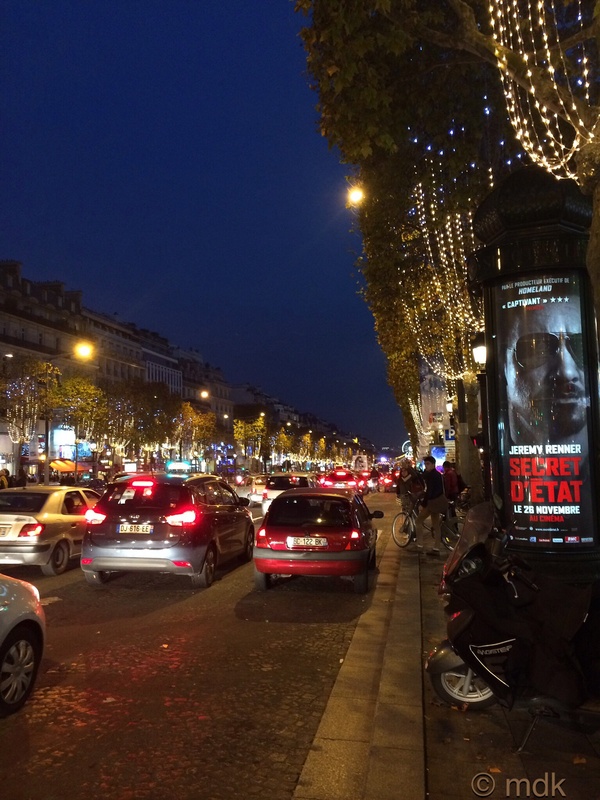 On a normal day the Champs Élysées is bad but, when we got across the road, we found a row of chic white Christmas market stalls had been set up all long the edge of the wide pavements. The place was heaving. My phone stayed firmly zipped in my pocket and I concentrated on not losing Commando again. It wasn’t until we stopped waiting to cross the ridiculously chaotic six way crossing of Rond Point I snapped a quick photo of the fountain all lit up before I was swept across the road. Eventually we made it to Place de l’Étoile, renamed Place Charles de Gaulle in 1979 after the death of President Charles de Gaulle but still called l’Étoile by the locals . This is probably the busiest intersection on earth with twelve roads converging and such a chaotic melee of traffic in the centre it’s a wonder there are not skeletons in cars where people have become hopelessly stuck. 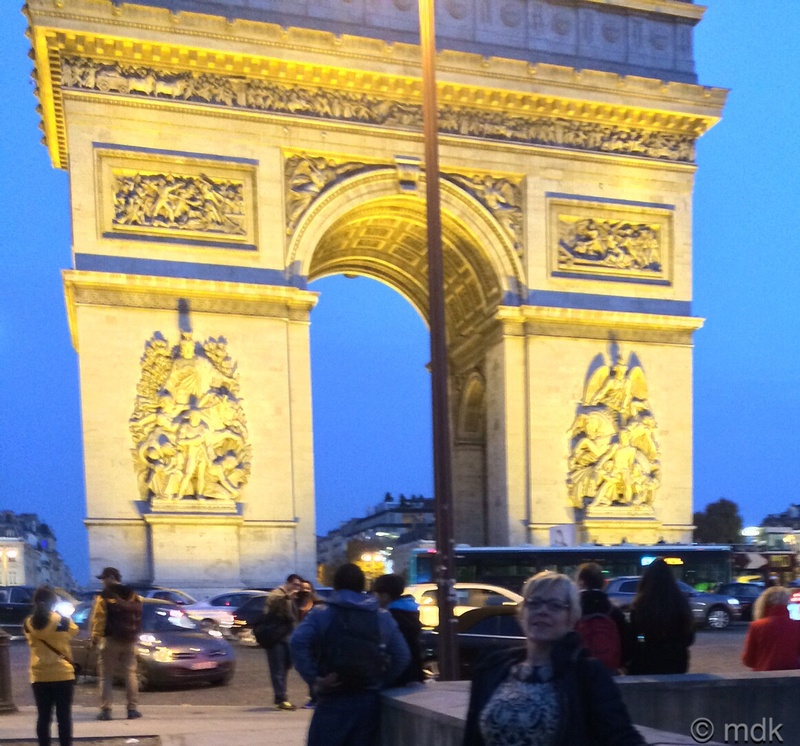 Standing in the centre is the Arc de Triomphe. We walked under the underpass only to find a long queue to go up to the Arc de Triomphe, not only that they were charging admittance. We’d seen it before years ago when we stood quietly contemplating the tomb with our boys. A long queue and an admittance charge to stand in a crowd were not very appealing so we passed by and crossed to the other side of Etoile. Here it was quieter and we stood for a while contemplating the beautiful arch and the insane and unrelenting traffic circling it. 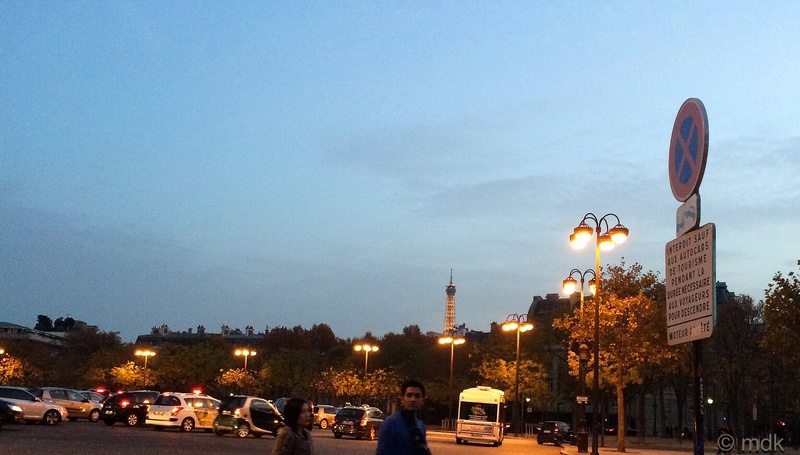 In the distance the Eiffel Tower shone like a beacon. The sun set as we stood there and the floodlights came on, changing the character of the building completely. 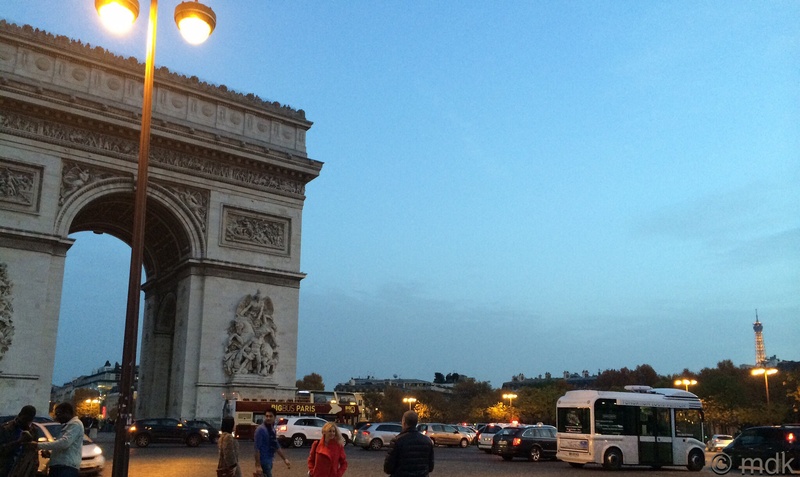 Our second day in Paris ended with a slow walk along the other side of the Champs Élysées. Thankfully it was slightly less crowded but I can’t help but notice the irony of calling this place Elysian Fields. 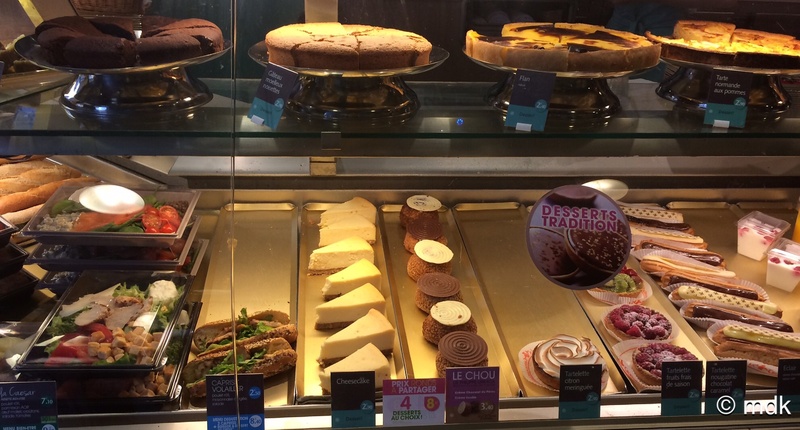 I, for one, couldn’t wait to get back to the relative peace and quiet of the area around Gare du Nord and a chocolat chaud at our favourite little café. You certainly saw a lot though sorry the crowds were so frightening. You took some lovely pictures as the light was fading, thanks for the tour. We did a massive amount of walking, more than ten miles a day, but it was wonderful. 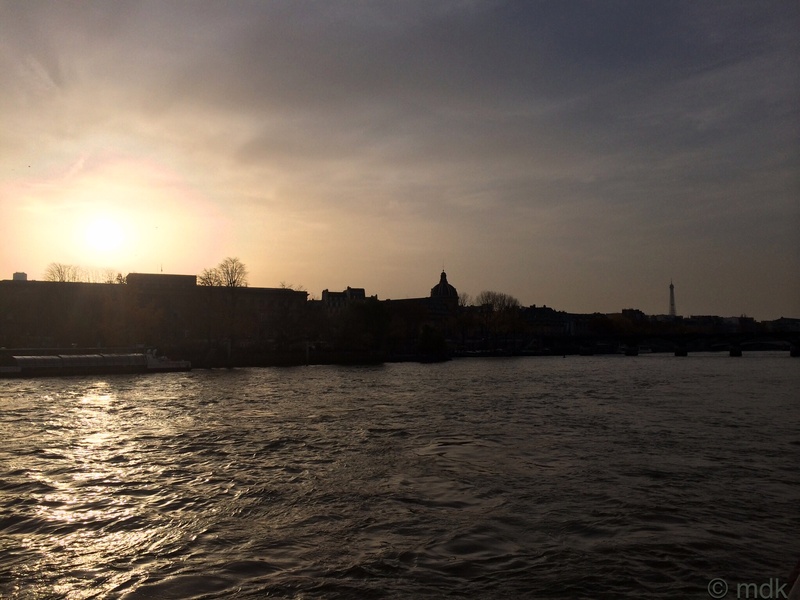 The walk along the Seine as the light was fading was perfect. Are those Christmas lights? If so they certainly put them up early. I’ve never heard of a portable Ferris wheel that big! They are Christmas lights. They’re spring in up all over the place here. I couldn’t believe it when I read the Ferris wheel was portable, it’s huge! 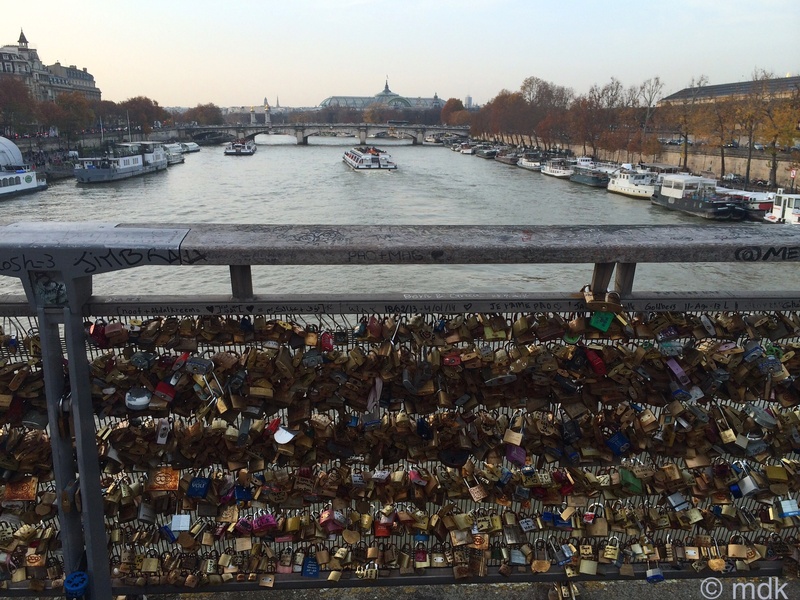 Interesting tour – I’ve seen love locks like these displayed in a town near Kiev, Ukraine. Thanks, they seem to be springing up all over the place.